We launched the drifter again this past Saturday. This time we set it to transmit every six hours. We’re hoping that it goes out to sea and goes for a long ride. 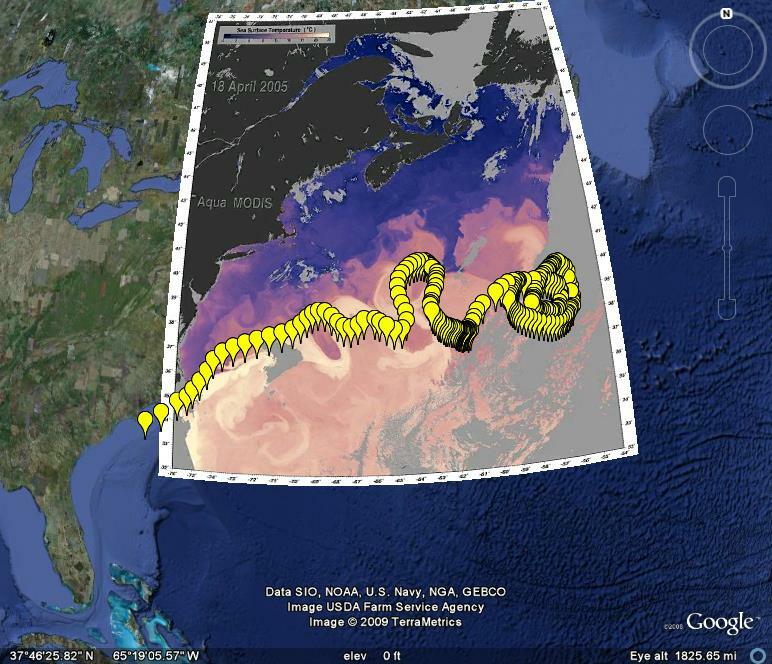 I find myself experiencing drifter envy over the beautifully long and sinuous path the Cape Fear Community College drifter has taken up the Gulf Stream. I don’t have much hope that the California Current will be able to match that ride, so we’ll have to settle with what we get. Before the cruise I gave my students this image and asked them to predict where the drifter would be in 48 and 96 hours, hoping the challange would give them experience in calculating distances using the rate equation, as well as piquing their interest in following the drifter’s journey. We purposefully chose a deployment site where it was a tossup whether the drifter would circulate through Monterey Bay or drift out to sea. There wasn’t a right answer. On the assignment, I merely looked to see that the answers were supported by some sort of manipulation of the rate equation. Here’s the predictions I got from the students. White locations are 2-day forecasts; purple locations are 4-day forecasts. 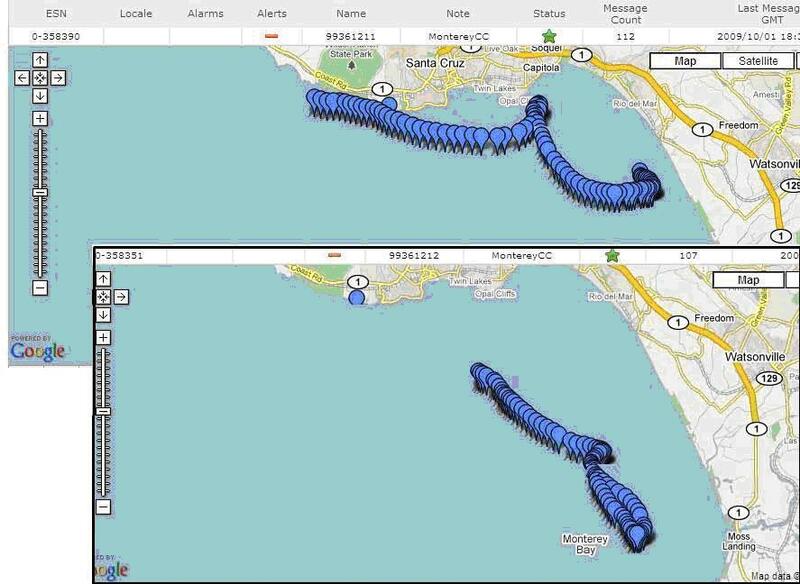 On the image you can also see where we intended to deploy the drifter–at the MBARI M1 buoy–and where we actually deployed the drifter; we didn’t quite make it to the M1 buoy in our allotted cruise time. Today in class, the students manipulated the tracking site and Google Earth to show that the 2-day location of the drifter was almost exactly right in between two of the predictions. So we had two winners. So far the drifter has traveled a few miles SW and then turned around and backtracked to the NE. 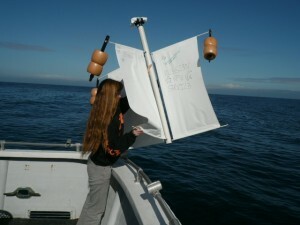 Here’s a few pictures of the students deploying the drifter. Our Vice president of Academic Affairs asked me the other day if the tsunami affected the motion of the drifters here in Monterey Bay. “Voile!” I thought, what a great idea for a lab. If our vice president thinks that the tsunami might have affected the drifters, then our students must have the same question. So I developed the lab linked below. I developed the lab to generate interest in the motion of the drifters. My students started on this lab on Monday and will finish it today. 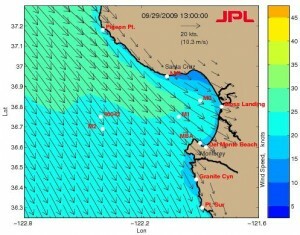 What I’m realizing is that perhaps the main benefit will be that in order to understand why the tsunami did not affect the motion of the drifters, the students will have to internalize how waves move about in the ocean, that it is not the flow of water parcels, but rather the water parcels interacting with each other to cause a wave. Ships out at sea are not affected by tsunamis, and neither are our drifters. The MPC Drifters are back in the water this week as our MBARI collaboration continues for a second week. 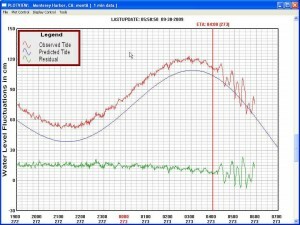 The data on the image above represents about 27 hours of data, from the afternoon of October 5 to about 6 pm local time of October 6. It illustrates quite nicely the 24-hour periodicity that is evident in much of our data. We have semi-diurnal tides here on the coast of California, so that pattern is not tidal. The drifters tend to have a stronger SE component of motion in the afternoons and a stronger NW component of motion in the early morning hours. I’m trying to get some images of students deploying and retrieving the drifters. I’ll post them as soon as I get them. A couple of MPC Oceanography students accompanied the MBARI team to recover the drifters yesterday. They quickly found both of them and brought them back on board. They were out for almost exactly 48 hours. After drifting south for the first 12 hours or so, perhaps due to strong NW winds that day, they turned and drifted north and west, along the expected counterclockwise rotation of surface water in Monterey Bay. Here is a quick and dirty cut and paste job of their complete paths. I don’t have the software set up yet to make my own maps of their paths. These are from the AeroStar tracking website. They generally drifted from southeast to northwest. 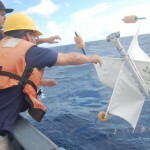 We’re very happy with this first deployment of the drifters and thank the MBARI team of John Ryan and Erick Rienecker. The MPC students seemed to enjoy it as well. Four of the five we sent came back very enthused about the whole experience. They took some pictures, but I haven’t been able to get their pics downloaded onto my computer. Maybe we’ll see some next week. Identifying exactly what we would see, and on what timescale, if the tsunami affected motion. Looking at the data to determine if the identified changes in motion did or did not take place. The anticipated outcome is that the tsunami did not, in fact, influence the movement of the drifters. Hopefully, this will be a useful realization that wave motion and current motion can be totally different because they are totally different processes. We know, for example, in the northeastern part of Monterey Bay that the longshore drift of the sand on the beaches is in exactly the opposite direction (west and southwest towards Moss Landing) than the surface currents (north and west, as our drifters demonstrated). So it would follow that tsunami motion would not necessarily be detected, especially at the temporal resolution available to the drifters (one measurement every half hour). I’ll share this if I get it going. 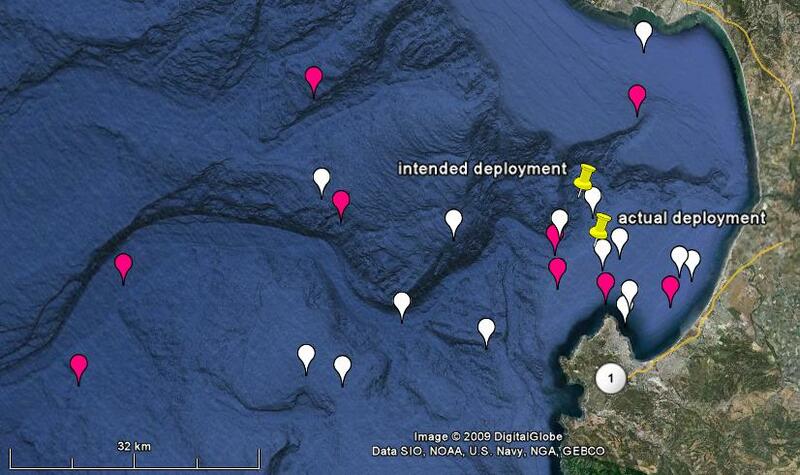 This is what the path of one of the drifters looks like today, approximately 24 hours after deployment. 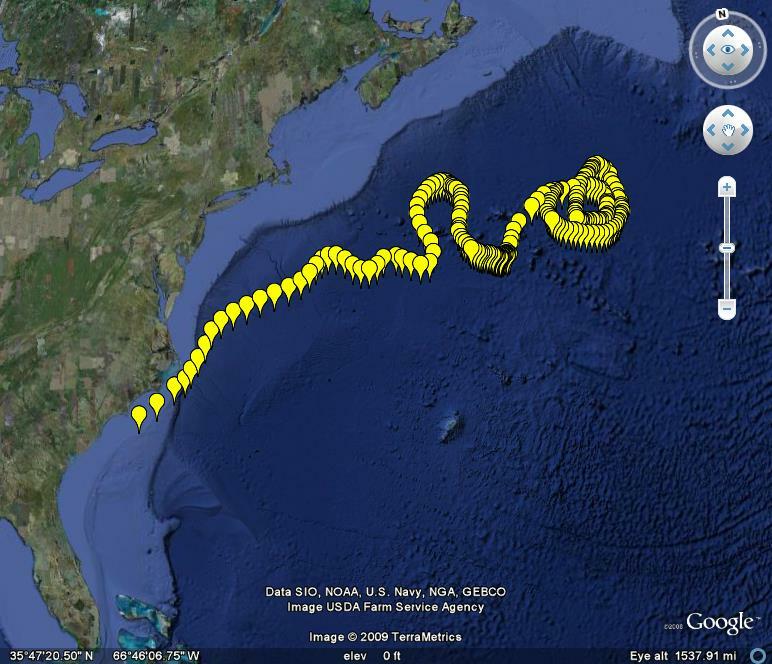 Remember yesterday, the drifter was taking a southerly route. Today, the drifters have turned northwards. Today is not as windy as yesterday. This is what the other drifter path looks like today. It has also turned north after drifting south the first day. This one may have drifted further south the first day because it was deployed closer to the Salinas Valley, where the onshore winds are strongest. Well, maybe. Here’s what the winds look like today. 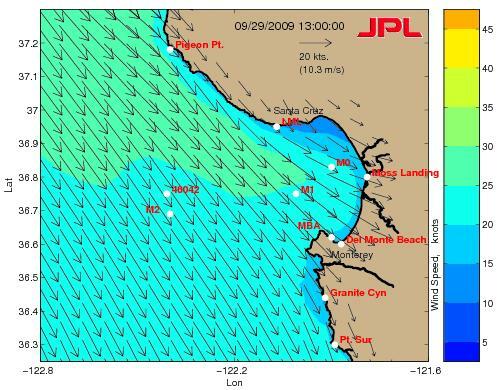 You can definitely see that the wind speeds are lower today, especially in the northeast portion of the bay where the drifters were deployed. We had a bit of a distraction today with the Samoan earthquake and tsunami. The tsunami made it all the way to Monterey by yesterday evening, although its amplitude was only a few centimeters by the time it made it here. 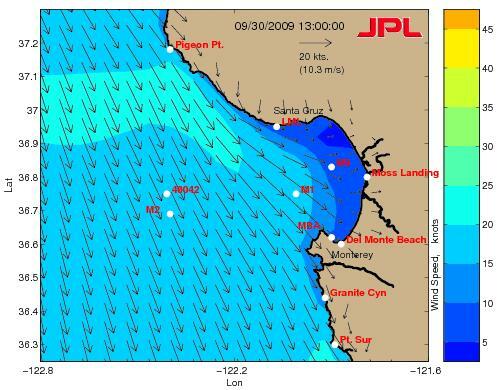 In the image above (click on it for a larger image), you can see that the tsunami entered Monterey Bay at just past 0400 on Day 273, which is Sept 30, 2009. I guess we can say that the drifters survived a tsunami on their maiden voyage. 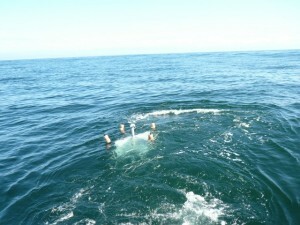 I just got word from the MBARI guys that the drifters will be recovered tomorrow. We’ll be sending a few more students on the cruise with them. You can see two drifters are out there; the single position is from when the ship was on the way to deployment. Both of the drifters are drifting south or southeast. 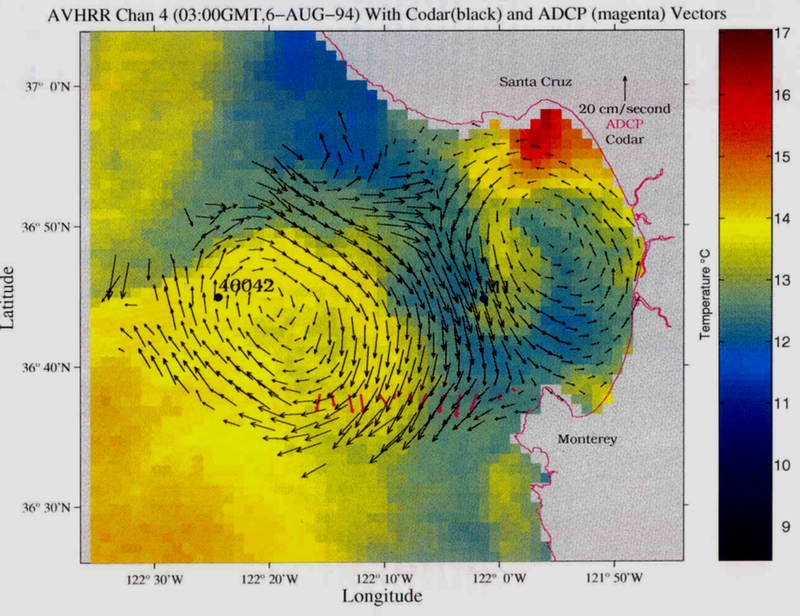 This is somewhat unexpected as we thought the circulation in Monterey Bay was counterclockwise as I explained in my previous blog. Wonder why the drifters are drifting southsouthwest? They are moving directly towards the Salinas Valley, probably as a result of seabreezes that pick up every afternoon here. At least that’s my current (ha ha) hypothesis. 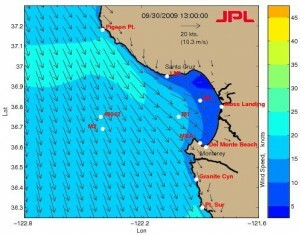 The winds today are shown on the image above, blowing straight towards the Salinas Valley, which is between Moss Landing and Del Monte Beach on the image above. 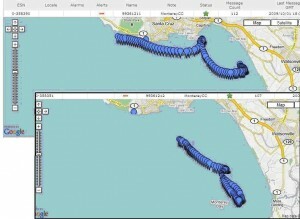 The drifters were deployed northeast of Moss Landing, somewhat north of the MO buoy as shown on the image above. Follow along at the usual spots. I’ll share the response of the students in a later installment. Greetings from the Central Coast of California. This is my first attempt at blogging, so I hope I do it right. From what I’ve read on other blogs, I think I’m supposed to record my stream of consciousness and try to stay somewhat on topic. We’ll see how that goes. 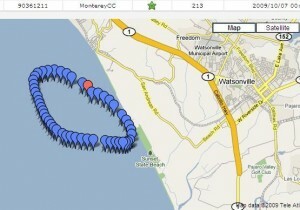 Those circular patterns you see in Monterey Bay on the image on the right are not tidal. They have a 24 hour periodicity and form in response to offshore and onshore breezes that cycle back and forth throughout the day. Jeff and I talked quite a while about HF radar and I learned quite a bit. I still can’t explain all the intricacies of which frequencies they use to get the best Doppler Effect and why, but at least my eyes won’t roll too far back in my head next time we go through it. 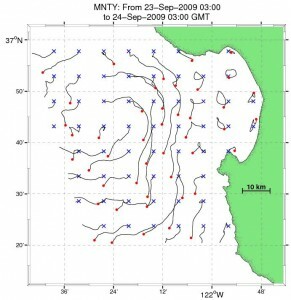 We also talked about “typical” ocean circulation patterns in Monterey Bay. The image below is from one day back in 1994—exaclty 15 years ago from our drifters workshop. The image shows ocean currents layered over sea surface temperatures. It shows the typical counterclockwise circulation in the bay and the clockwise eddy just outside the bay. As was true on this day in 1994, the northeast portion of the bay is the warmest, and this water is pulled out into deeper water by the currents. 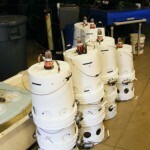 I looked at some of the drifters that Jeff uses in his research. They’re commercially made by Pacific Gyre. They have a floating sphere that contains the transmitter and then a sail system that opens up like an umbrella. The next stop in my tour of ocean current researchers was the world famous MBARI, the Monterey Bay Aquarium Research Institute, to visit Erich Rienecker and John Ryan. 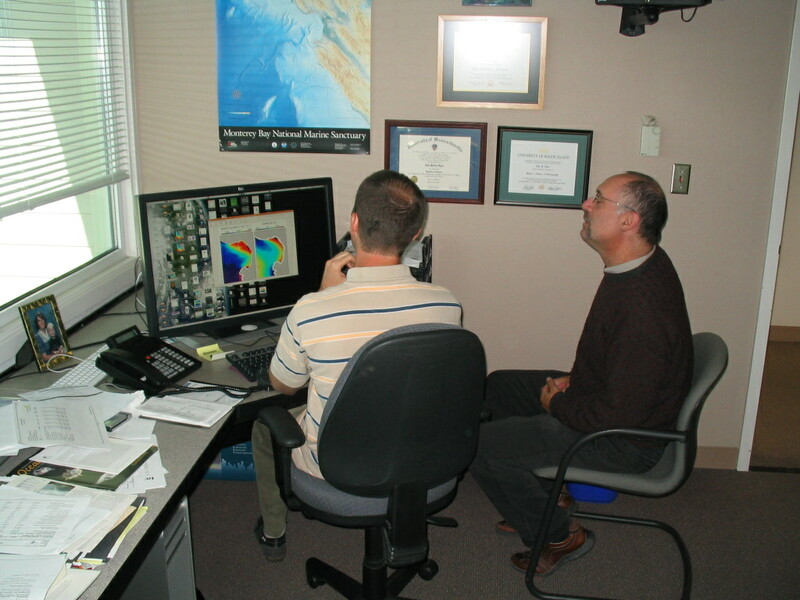 Erich is one of the marine technicians and John is a researcher specializing in phytoplankton blooms. Here’s John and I looking at some eye-popping data on John’s computer. I was just blinking, I swear. The left image shows satellite-generated data for chlorophyll in the water, whereas the right image shows sea surface temperatures. 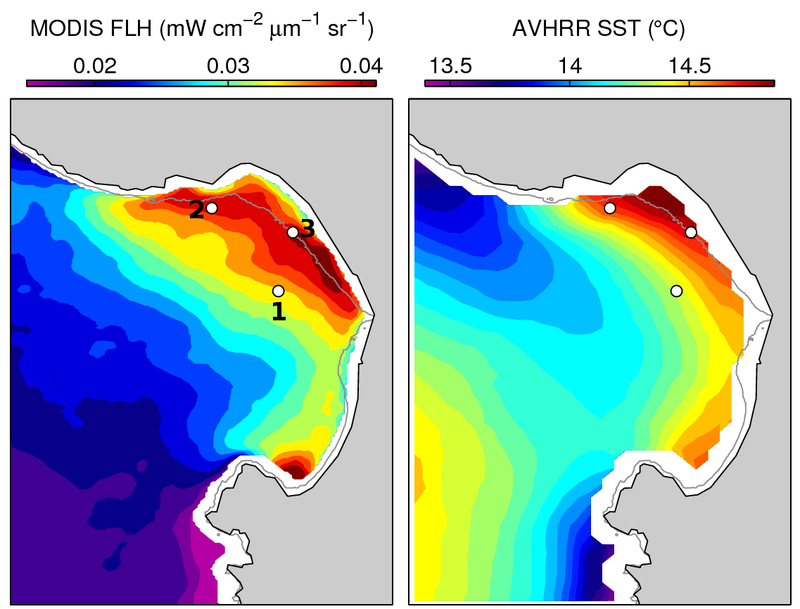 Clearly there are other factors besides just temperatures driving the magnitude of plankton concentrations. The last week in September and the first week in October, John and Erich will be involved with an intensive data gathering effort in this area involving satellites, AUVs, moorings, and………..drum roll please……… OUR DRIFTERS! On Monday September 28 and Monday October 2 we’ll send students out on their cruises to deploy our drifters and launch their AUVs among other tasks for this study. 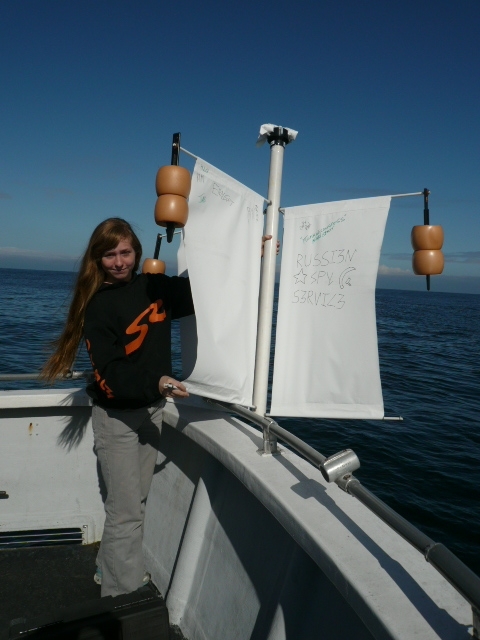 Later in the week, we’ll send students out with them to try and retrieve the drifters. Should be fun, and a great experience for the students. Back in the classroom, we’ll be following the progress of the drifters on the computers. 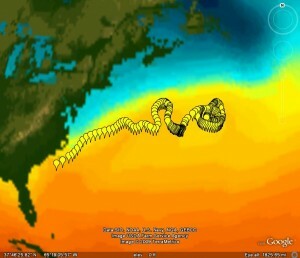 Hopefully this will set the stage for increased interest in learning about atmospheric circulation and ocean currents. Then, in early November, we’ll take the whole class out on a cruise and release one of the drifters once again (assuming all goes well with the MBARI guys).